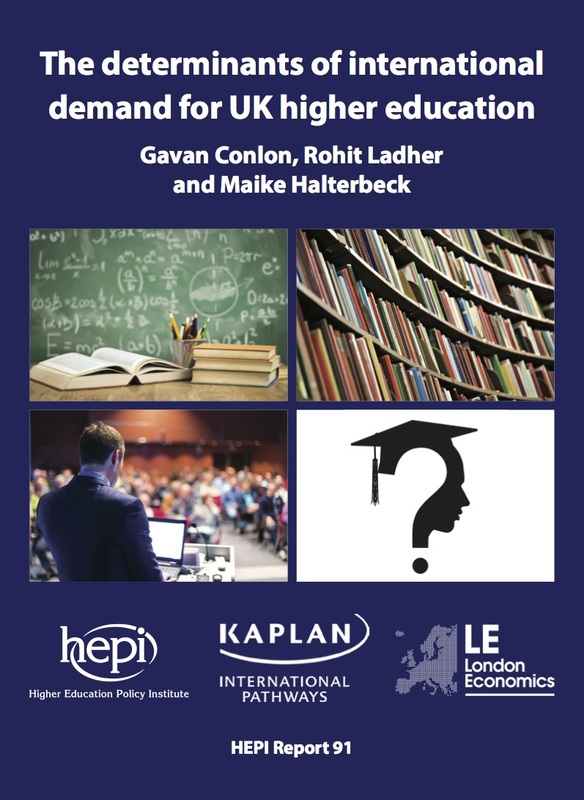 Today (12 January), the Higher Education Policy Institute and Kaplan International publish the first detailed modelling on what Brexit and other global changes could mean for demand at UK universities from international students. The research, published as The determinants of international demand for UK higher education and undertaken by London Economics, reveals a mixed picture. Some changes (e.g. higher fees for EU students) would reduce demand. Others (e.g. depreciation of sterling) would increase demand by reducing the price of studying in the UK for those from other countries. A 10% depreciation of sterling could increase enrolments from all other countries by around 20,000 students – an increase of 9% – in the first year, worth £227 million in fee income. Conversely, harmonising the rules for EU and non-EU students could reduce enrolments from other EU countries by over 31,000 students (a 57% decline in EU students) – amounting to a net loss of £40 million in the first year (after accounting for higher fees from those who still study in the UK). The oldest universities will gain the most financially, with Oxford and Cambridge standing to receive over £10 million more in fee income each year on average, while less prestigious universities stand to lose modest amounts of income (around £100,000 on average). a 1% increase in GDP per capita internationally could produce an increase of 0.5% in the number of international undergraduate enrolments in the UK. £928 million a year less from the detrimental impact on universities’ supply chains (known as ‘the indirect and induced effects’). This loss would be additional to the billions of pounds that would be at risk from any big cut in the number of international visas for students. British universities are in choppy waters and this research shows the options ahead. Policymakers can either push our higher education institutions towards the icebergs or help them reach the relative safety of the open seas. Were the Home Office to conduct yet another crackdown on international students, then the UK could lose out on £2 billion a year just when we need to show we are open for business like never before. Removing international students from the net migration target would be an easy, costless and swift way to signal a change in direction. Post-Brexit changes around the status of EU students in the UK and on-going talk of further international student regulations make forecasting student numbers and revenues more difficult than ever for universities. Compounding these challenges is the uncertainty this creates for international students, increasing the likelihood of students choosing to study in other countries, resulting in a significant loss for our universities and the communities they enrich. In a period of significant economic uncertainty, there are substantial export opportunities available to UK higher education institutions. However, these opportunities can only be seized if universities are allowed to deliver them. With an economic value of £2 billion per annum, there is ample reason to allow more international students to come and study in the UK, thereby boosting UK prosperity, as well as maintaining the UK’s global reach and influence. A longer report with detailed analysis is available for download. HEPI’s mission is to ensure that higher education policy-making is better informed by evidence and research.We are UK-wide, independent and non-partisan. Kaplan International Pathways supports 40 partner universities around the world by increasing their international student enrolments and preparing students for higher education study. London Economics are one of Europe’s leading specialist economics and policy consultancies. Extremely useful and timely report. Unfortunate that the language of the debate is being set by the government. “Yet another tough crackdown on international students is expected”. The term “crackdown on” refers usually to something regarded as undesirable but it is only the Prime Minister who seems to feel the need to attack one of our most successful export industries. What other successful industries could she “crack down on”? The car industry? – only allow the better quaility car companies to sell their products to foreigners? The tourist industry – only allow tourists to visit a selected few nice places in the UK? Students aren’t migrants, they are customers. An interesting article noting possible upside and downside risks around Brexit, UK immigration policies and other wider global macro factors. Whilst I haven’t read the full report, I’m surprised to see no mention of the high proportion of EU students currently accessing the UK student loan book and the impact of withdrawing this facility alongside increasing prices to international fee levels.